The finest soldiers the world has ever known. Sheena and I watched this movie earlier in the week. I can honestly say that going into it I wasn’t expecting to like it. I knew that it was based off of a graphic novel by Frank Miller. The last movie based off of a graphic novel by him was Sin City, which I did not like at all (aside from the “look” of the film). I had decided that this film would also be one that was very well made, but other than that it would be lacking. Although the plot isn’t deep, nor the dialog superb, I really liked this movie. It was cool to learn about the way Spartans were raised, and how much they valued their army and strength. It was also just really cool. About halfway through the movie Sheena said something like, “This whole movie is fighting. Like…I’m going to come at you really fast and then stab you in slow motion. I’m going to come and you really fast and then punch you in slow motion.” This is a very true statement…but it sure was cool. 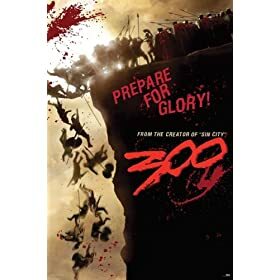 All this to say, yes, the movie is pretty much just sweet battle scenes with some shady politics thrown in, but it was a good time and I’d recommend it. 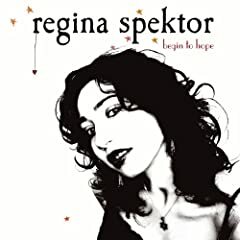 the newest Regina Spektor CD. but i didn’t take it out of my CD player…and now i like it a lot. i hate research papers but i love smoothies. This is funny. And sad. Shouldn’t he be singing something more like Old McDonald? My favorite part is his “beat” at the beginning. A couple of nights ago Sheena and I watched this movie. and remembered it being a good story. I will say that for the most part I enjoyed it. It’s definitely a kid’s movie, but it was never stupid or boring. which I totally wouldn’t have expected. because Sheena told me it was going to happen before it did…). as the main character’s little sister. She is so cute and funny. of the other really good movies that are out right now. maybe once it gets put on ABC family or something. but sometimes it’s quite hilarious. and gives them commentary of some sort. is knowing that i’ll have some leftover for the next day. leftover spaghetti is even better. are there any foods you like better the next day? Are we shooting people or what? I don’t know the answer! That’s what I’m trying to find out!